Venous leg ulcers, also known as stasis ulcers or varicose ulcers, result from inadequate blood flow in your legs that causes blood to pool in your veins. The condition is generally a complication of other leg problems, such as venous hypertension and chronic venous insufficiency. The ulcers are open wounds that can be painful and, if not treated, can become infected. Herbs may help relieve the pain and heal the wound naturally. Consult your health care provider before starting herbal treatment for venous leg ulcer pain. Herbs for venous leg ulcer pain work in different ways. Anti-inflammatory herbs will soothe irritated and damaged tissue, relieving pain. Some herbs will help heal the underlying problem — venous insufficiency — that leads to painful leg ulcers. Herbs for wounds will help heal the ulcer and eliminate pain. Check with a knowledgeable practitioner for advice about dosage and preparation of herbal remedies for venous leg ulcer pain. 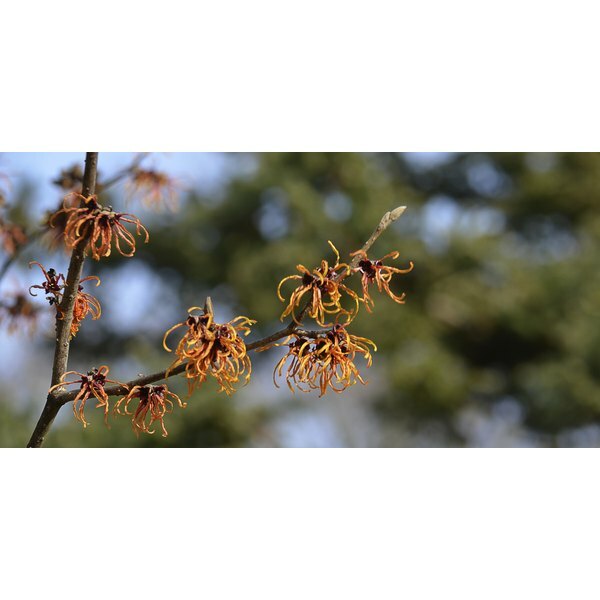 Witch hazel, or Hamamelis virginiana, is a small tree native to North America. Herbalists use the leaves and bark to treat diarrhea, gum inflammation, wounds, venous disorders, hemorrhage, skin problems and sore throat. The plant is rich in tannins, which have astringent, anti-inflammatory, hemostatic and antiseptic actions. In their 2001 book, “Herbal Remedies,” naturopathic doctors Asa Hershoff and Andrea Rotelli recommend applying witch hazel topically for leg ulcers. It will tighten tissues, and reduce pain and inflammation. Discontinue using if your skin becomes irritated. Comfrey, or Symphytum officinale, is a European perennial with a long history of medicinal use. Traditional healers use the roots, rhizomes and leaves to heal wounds and boils. Comfrey is rich in allantoin, a plant chemical that enhances the growth of new tissue. It also contains rosmarinic acid, which is an anti-inflammatory, and mucilage, which soothes pain and heals damaged skin. In their 2000 book, “Prescription for Nutritional Healing,” Dr. James F. Balch and Phyllis A. Balch, CNC, advise making a compress of comfrey tea and applying it to your inflamed leg ulcers. Only use comfrey externally. Gotu kola, or Centella asiatica, is a creeping herb found in tropical regions of Africa, Asia and North America. Herbalists use the whole plant as a remedy for wounds, burns, venous insufficiency and skin ulcers. It is an ingredient in commercial creams and ointments used for relieving pain and inflammation, and it also helps prevent scars. In their 2009 book, “Medicinal Plants of the World,” Ben-Erik van Wyk and Michael Wink explain that gotu kola contains triterpenoids that stimulate collagen I, a protein involved in wound healing. This herb also has anti-inflammatory and antimicrobial actions, and Hershoff and Rotelli recommend it for painful venous leg ulcers. Gotu kola may cause stomach upset, drowsiness or nausea if used internally.